All transactions are safe and secure with a reliable history in online purchasing behind each of our associates. 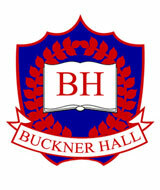 Buy the Buckner Hall Crest t-shirt to own Switched at Birth clothing and merchandise. Whether you like the school on these Buckner Hall shirts or not, the name would look impressive on any college application, which is why the Kennish kids attend. Their parents strive to put them ahead in any way possible, but sometimes a forced fit isn't the best fit. While Toby may break the rules on occasion, Bay would be the first to agree that it isn't her cup of tea. Show which school you'd like to attend by picking a Switched at Birth shirt that suits you best. In addition to the Buckner Hall Crest tee above, browse the Switched at Birth Clothing Gallery for more apparel like men's and women's clothes, kids shirts or hoodies.